The Defender 3.5 seal is C-TPAT & PIP compliant - rated to a High Security Level under the ISO/PAS 17712:E Standard. Featuring a 3.5mm diameter aircraft cable 12" length (added length available). 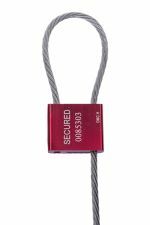 Seals are anodized red aluminum and come with a 12" long cable as the default length. Please lick Customize for before adding to cart.